There’s a reason I like to write. Actually, there are many. But one of them is, I can sit in the sunshine at my kitchen table in the created world of my choosing, with my two faithful dogs for companionship. No one stares at me blankly. There are no awkward silences. I don’t find myself fervently wishing to be anywhere but there! Put me in front of a blank sheet of paper or a new Microsoft Word document and I can almost always think of something to say – maybe not the next great American novel, but something. Put me at the front of a room with a bunch of people (the kind that are over 4 feet tall and 10 years old) staring at me and waiting for me to enlighten them and my mouth goes so dry it won’t work properly, my hands tremble, and I have a sudden first-hand understanding of palpitations. You know how in books people are paralyzed with fright? I’m not paralyzed – I shake! All but my mind. THAT gets paralyzed. I can’t think of a single word to say, even with notes in front of me. So. How was the conference? you’d like to know. I drove to Saratoga Springs in the pouring rain. This is getting to be a habit with these author outings. It was cold and gray and wet, and I’m wondering if spring will ever come this year. The hotel was very nice. 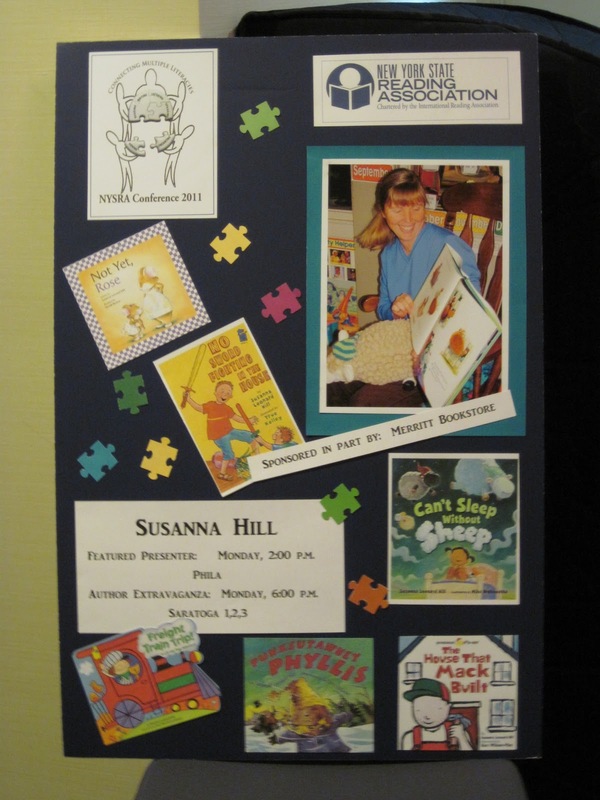 Merritt Book Store had set up a beautiful display, selling books by all the attending authors. I had the extreme pleasure and privilege of chatting with Anne Mazer and Ellen Potter, two wonderful people and fellow authors whom I had met Saturday at the Empire State Book Festival, Michael Garland, the talented author and illustrator of many books for children, and Doreen Rappaport, the inspiring author of many biographies and historical books for children. I also met lots of other very nice people. Dinner was fun. I got to witness the formal presentation of the Charlotte Awards, sit with a number of interesting people, and hear all the other authors who were in attendance get up and speak, all of them very inspiring to listen to. 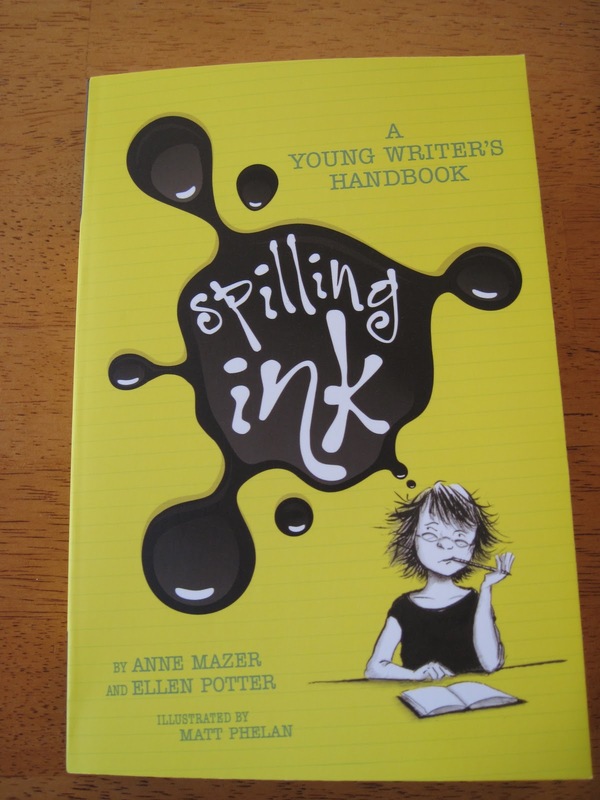 Here is the copy of their new book, Spilling Ink (which I highly recommend! 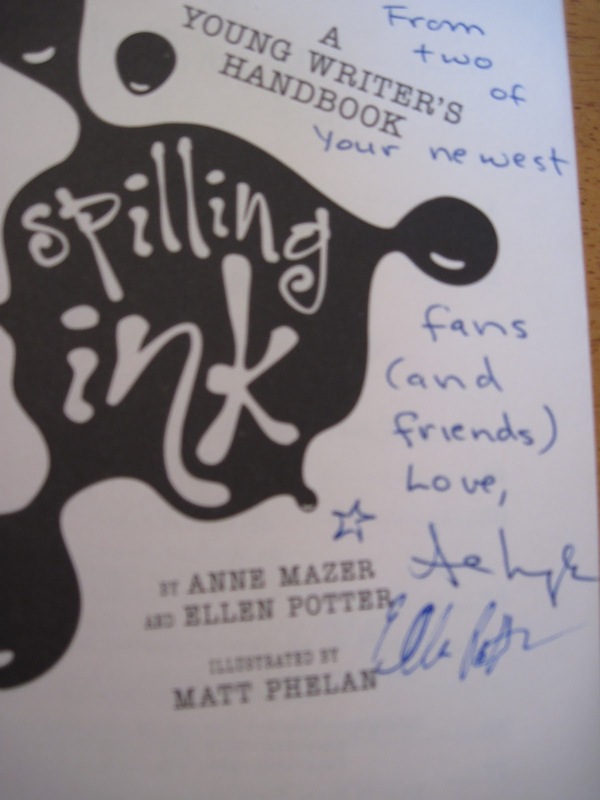 ), that Anne and Ellen signed for me as a gift for surviving my talk! The drive home was late and also in the rain. I live in New York, too! Nice to meet you – *waves*. Nice to meet you, too, Brooke! BTW, I completely missed the 2nd challenge! For fun, I may go ahead and do it if I can squeeze out a few minutes in the morning. For a minute there, I couldn't see where you actually commented on how your speech went. Then I saw it there, in the tiny writing. Hehehe, you poor dear. Hope it gets easier for you, but at least you know you're not alone in that fear! So many people would rather die than speak in public. Maybe there's a learning curve. I was terrified to speak in front of kids when I first did it, but now, a couple hundred school visits later, I'm fine with it. But yeah, yikes! E.J. – definitely add your sentence if you have time and want to! That which we persist in doing becomes easier, not that the nature of the thing changes, but our ability to do increases. (Can't remember who said that originally.) Keep up the good work you're doing!It will get easier. Thanks, Catherine. Did you get your books yet? Susanna, it sounds like a good experience, once you got through the fear. I used to be painfully shy and was terrified when I had to defend my doctoral thesis — it took months of coaching for me to get through it, especially being put on the spot to answer questions.